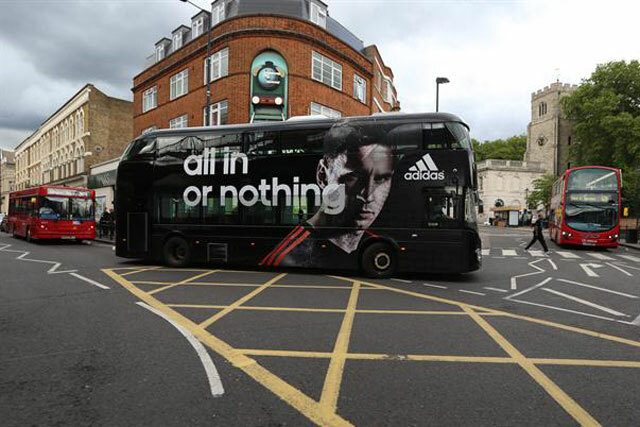 Adidas has become the first brand to paint entire Routemaster buses, as part of its "all in or nothing" World Cup campaign. The sportswear brand has painted 32 new Routemaster buses black – one for each World Cup team – with images and straplines from its campaign for the 2014 Fifa World Cup as part of the deal. Transport for London launched the new advertising format as part of its "year of the bus" celebrations, which commemorate the 60th anniversary of the Routemaster bus and the 100th anniversary of the first mass-produced motorbus, among other things. The new format will only be available to brands in 2014. Exterion Media, the outdoor media owner, developed the campaign with Posterscope, Carat and TBWA. The painted buses will be on routes 38 and 8, which travel through Piccadilly Circus and Knightsbridge, and Shoreditch and the City respectively, for four months, beginning 24 May. Jason Cotterrell, the UK managing director at Exterion Media, said: "We’re particularly proud to be part of such a fantastic campaign with Adidas. Painting the entirety of one of our iconic new Routemasters is an entirely new approach to bus advertising and is guaranteed to turn heads on London’s busy high streets. "The capital is the centre of creativity for advertising, so we’re really looking forward to seeing what other brands can do to make the most of this incredibly powerful advertising platform."